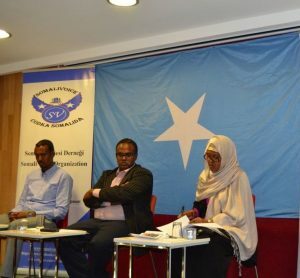 Voice is a non-government, non-profit independent organization which was officially registered in Turkey and was founded in 20th February 2015 by a team of Somali intellectuals and professionals, to encourage young Somalis to participate research, education and youth development in Somalia. To address and discuss youth and education development issues that concern to common Somali community. To call for discussion, dialogue and engage research activities among young Somalis. Allowing young generation to discuss and address construction issues that concern to the Somali people and the development of the youth as a whole. This organization has two headquarters the main headquarter is Istanbul, Turkey and the second headquarter locates in Mogadishu, Somalia.